AlgaeFix is a fish and plant friendly algaecide which effectively controls most types of algae, including green water (unicellular), string or hair algae, and blanketweed. AlgaeFix controls existing algae and helps resolve additional algae blooms. Keeps ornamental ponds and water gardens clean & clear. * Safe for Fish and Plants When Used According to Directions. * Will Not Stain or Color the Water. * Know the Volume of Your Pond and Dose According to the instructions. * Make Sure Your Pond Has Adequate Aeration Before Using AlgaeFix. * Do Not Use AlgaeFix In Ponds With Crustaceans, Including Crabs, Freshwater Shrimp, and Freshwater Lobsters. 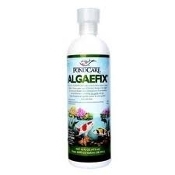 Add 1 teaspoonful (5 ml) of Pond Care AlgaeFix for every 50 US gallons (190 L) of pond/fountain water. Thoroughly mix Pond Care AlgaeFix into the pond/fountain water by adding it near the pump outflow, waterfall, or aeration device. 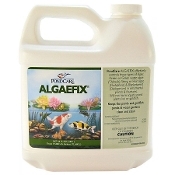 Pond Care AlgaeFix can be mixed in a bucket of pond/fountain water and dispersed evenly around the pond/fountain. Repeat dose every 3 days until algae is controlled. Be prepared to siphon out dead filamentous algae. Once algal growth is under control, add one dose per week. Weekly doses of Pond Care AlgaeFix will control algal growth and reduce pond/fountain maintenance. Mud Monsters has used and sold AlgaeFix for over 15 years. If you have any questions or concerns regarding it's use, please feel free to call or email us.